The brain is composed of 100 billion neurons, of which the cerebral cortex has 10-15 billion. Those 10-15 cerebral neurons each have approximately 10 thousand interconnections with other neurons, nearby and distant. With so much neural complexity and activity it might seem nothing useful could be offered concerning parallelism in the brain, but below are two types of parallelism that it is worth knowing about. There are many avenues of parallelism in the brain. Here we are ignoring the low-level parallelism of sensory data in which half of each sense’s data enters opposite areas of the brain and through complex parallel steps is seamlessly integrated into a consistent whole. This occurs below the level of consciousness, awareness, and control. Since Daniel Kahneman wrote Thinking Fast and Slow, the understanding that learned habits like driving are performed by one part of the brain leaving the rest of the brain available to talk with passengers, listen to the radio, or muse about the day’s events at the same time handling the driving tasks is often used. The Mental Construction explanation of thinking is not a repudiation of the dual process of System One (Fast) and System Two (Slow) but offers a different perspective on their origination. The Fast mode of thought emerges from its emotional origin as well as from a less precise method of thinking. Dual methods of cognition, particularly in the cortical executive areas, and different latencies of action expose some structure in the Slow mode. These points will be developed below. Before I delve further, let me add that these two parallel paths always exist, but their distinctions aren’t usually noticed, because they recommend the same action or they recommend actions in different time frames or for different goals. Let me name two significant threads of parallelism that confront and sometimes confound us. Emotion versus Reason and Immediate versus Planned. Sometimes emotions makes us want to proceed along one path of action, while logic warns us against that course of action. This can lead to an indecision almost everyone is familiar with. The first path (Figure 1) originates in the limbic system, the part of the brain that developed with the reptiles, to help them handle the current situation they found themselves in. We retain that in the structure of our brain. The limbic system performs a summarization of our base needs, desires, and fears aroused by the here-and-now. The results are our emotions. We are unable to change our emotions, although we can at times ignore them. When our rational consciousness, existing in the frontal area of the cortex, recommend a different action, with effort, we can sometimes ignore emotional demands. Our emotional assessment of a situation is fast. It is instinctual. If a long, thin dark shape appears in the grass, we jump back as it might be a snake. We focus our attention on it, usually realizing it is a branch or not a snake. Our higher level consciousness then overrides the emotional reaction, and we can walk pass the long, thin dark shape on the path. 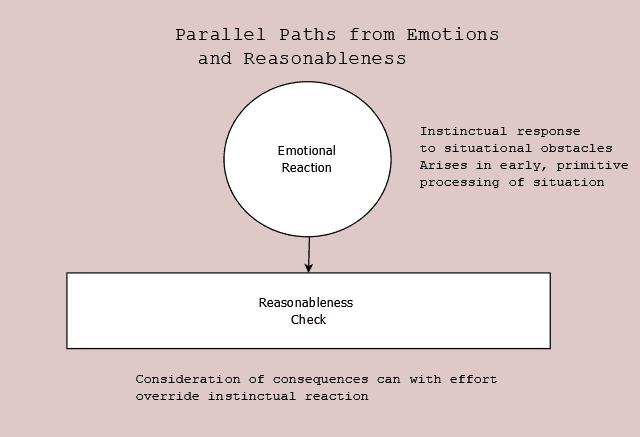 A second parallelism occurs at the higher level of consciousness where the demands for immediate satisfaction can conflict with delayed consequences. Both hemispheres handle their data by integration with memories, knowledge, and a person’s particular needs, desires, and fears, but the hemispheres handle the information by different operations. The second path (Figure 2. 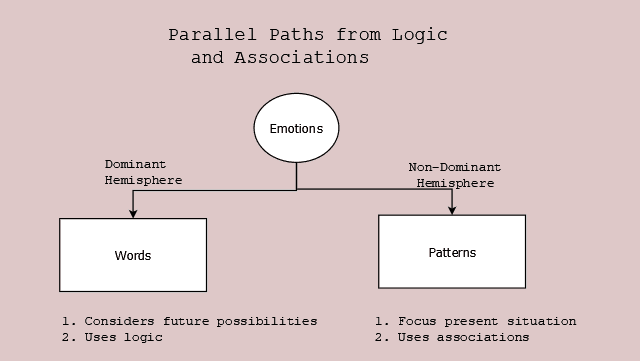 Parallel Paths from Logic and Associations) is a clash between the results in the cortical executive lobes. This arose with the use of language. The two hemispheres, although neurologically similar, have developed different treatment of information. The language-initiating hemisphere (the dominant hemisphere, left side Figure 2) organizes its concepts with words and phrases. Reality is defined as a truncation of sensory impressions and of situations into words and concepts a person has learned. For example, a stately oak may become a non-descript large tree to a city person who doesn’t know the characteristics of ‘oak’. However the dominant hemisphere has two strengths. With its verbal description, it can use logic to derive consequences of its mental worldview. It also can consider future consequences if parts of the current situation are changed, for instance, if new skill is learned. That expands job opportunities. This second feature intensively uses the limited working memory a person has. It also takes effort. The dominant hemisphere, since language has developed, specializes in planning—in how we may take intervening behavioral actions to increase the chances of satisfying our needs and goals while avoiding our fears. This is possible because the other hemisphere continues the legacy job it performs for all primates. The non-dominant hemisphere (Figure 2, right side) works with patterns rather than words. These patterns are closely yoked to personal experience. They are less abstracted than words as well as less connected to cultural norms. The non-dominant hemisphere patterns are related by similarities, not by logic. This association of patterns is the native mode of neural connections. It does not require special effort. It is fast. This hemisphere retains its focus on immediate response to current situation. Since it does not use words, it cannot conclude on the absolute best choice of action, but it does associate the current situation with the past action that worked best in a similar situation. This choice will not always be successful, as some detailed difference may turn out to be important, but the choice is fast and ready, if you need it. Consider playing an all-consuming physical sport. When you get so into, what athletes used to call “the flow,” words no longer exist. The dominant hemisphere ceases to interject into the relentless flow from current physical reality to your optimal bodily response. If you have ever experienced this, you have felt the immediate power of the non-dominant cortical hemisphere. In the opposite direction, consider a monk, alone in the quiet of a mediation chamber perhaps the same as one thousand years ago. Closing his eyes, he eliminates another sensory distraction. As the moments go on with no interruptions, with scarce sensory input, the thoughts in the monk’s mind lose their connection with the external world. With the demands for immediate action at zero, the non-dominant hemisphere lessens its grip on the monk’s mental state. In neither extreme does the other hemisphere actually cease processing, but their diminished contribution makes the other more visible. Why aren’t we driven crazy by different, contradictory thoughts bombarding us for our attention and choice? Thankfully, the both sets of parallel paths normally recommend a same action. However, when there are large uncertainties about important facts, the paths can diverge. For instance, if your newly licensed child is driving on a Friday night and an accident is reported on the news, your emotions will be raised, although your logic will remind you that it’s unlikely to involve your child. Despite that, you’ll listen for the location, just in case. In the first parallelism, the main distinction is between Emotion and Reason. The same emotion is fed upward to both cortical hemispheres, but the cortical results do not contradict one another. Only the dominant hemisphere can verbalize its discontent. The non-dominant hemisphere can only communicate its dissatisfaction by feelings, as of anguish. Although the two cortical hemispheres process their information in distinctly different manners, they communicate across the corpus callosum about every 50 processing steps. The results from verbal categorization and pattern feature comparisons are compared for suitable, against previous experience, and, if one is clearly superior to the other, that category is accepted by the other hemisphere. If the superior categorization is verbal, then the non-dominant hemisphere accepts the word, but as a pattern representation for its further non-dominant processing. Becoming a pattern means that the word exchanged will then be processed by similarities, not logical relationships. If the superior categorization is pattern, then the dominant hemisphere accepts it and forces the pattern into the closest words it can find. Naturally “forces” implies that further dominant processing with logic may result in consequences that similarities in the other hemisphere may not arrive at. You might think: what difference does it make that these two sets of parallel thoughts exist? A very good question to which I only have this answer. Know thyself. To know that emotional processes evolved many millions of years ago which our larger brain can sometimes overrule, both humbles and enlarges oneself. Considering it all, perhaps we are a half-a-step beyond, I know that I know nothing. Multitasking is switching our attention from one task situation to another. This is distinct from parallelism where the same situation is being evaluated in two separate ways. Multitasking occurs at a high level of consciousness. It is controlled in the executive regions of the prefrontal lobes. Parallelism starts with sensory input although the connections between the two hemispheres seamlessly melds into a unified view. Once unified this view proceeds by two separate methodological paths to evaluate the view as it relates to our needs, fears, and goals and then further with our experience and knowledge, which the executive lobes use each to contribute to decision-making.